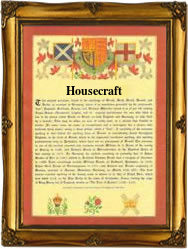 Recorded in several forms including Housecraft, Housecroft and Huscroft, this is an English surname. It is probably locational from some now 'lost' medieval hamlet or village called Huscroft or similar, and describing originally a house (hus) which stood on a croft, sometimes given as being a small farm large enough to support a family. As to where this place was is a mystery, as the terms hus and croft were used throughout the British Isles from as early as the Roman occupation which ended in 410 a.d. Locational surnames were usually 'from' names. That is to say names given to people as an easy means of identification after they left their original homes and moved elsewhere, often in search of work. it is estimated that at least three thousand British surnames do originate from 'lost' villages, so whilst unusual, this not a totally unexpected situation. As to why villages disappeared is a subject on its own, but usually this can be put down to changes in agricultural practices, and the increasing urbanization from the 16th century, when many smaller places where simply swallowed up by the advancing towns. In this case examples of the surname recordings taken from the early surviving registers of the diocese of Greater London include: Mary Huscroft, who married William Smith at the church of St Martin Orgar on November 2nd 1634, Richard Housecroft, the son of William Housecroft, christened at St Sepulchre church on March 29th 1696, and Henry Hustcroft, who maried Mary Landes at St Olaves, Hart Street, on December 10th 1743, all in the ancient city of London.